Preparing healthy meals is not difficult when you know the basics of nutritious cooking. Nutritious cooking begins with good planning, choosing healthy ingredients and knowing healthy cooking techniques. • Use smart fats like olive oil, canola, rice bran, sunflower oil etc over saturated fats and Trans fats. Whatever be the fats, use them in moderation to make cooking healthy and to reduce extra calorie intake. • Preserve the nutrients and colors in veggies. Cook them quickly by steaming, half-boiling or stir-frying. • Choose unrefined foods like brown rice, wheat and ragi to obtain maximum fiber, B vitamin, zinc, manganese and other micro minerals that are lost in refining. • Plan your meals ahead for the week which can save time and reduce any wastage. • Start stocking up the kitchen with healthy ingredients like whole grains, fresh fruits and vegetables, eggs, low fat milk, low fat cheese, paneer, herbs etc. • Go for flavor enhancers like fresh or dried herbs, citrus fruits and spices. They add good aroma and are excellent substitutes for oils and salt. • Use sweeteners judiciously. Sugars of any kind, whether corn syrup, white sugar, brown sugar or honey add significant calories without any nutritive value. 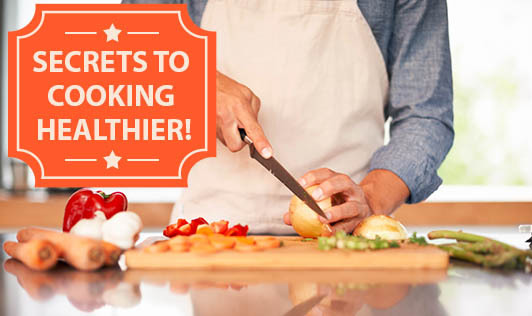 • Choose healthy cooking techniques like broiling, roasting, baking, steaming and grilling instead of deep frying. • Limit the use of spreads that are high in saturated fats and Trans fats. Replace them with hummus, home- made peanut butter and avocado puree and low fat cheese spreads to make the dish delicious. • Go for skinless chicken, fish and lean meat as they are high in quality protein and essential fatty acids.